27.1.1906: Launched by Lytham Shipbuilding & Engineering Co Ltd, Lytham (Yd.No.346) for Fylde Steam Fishing Co Ltd, Fleetwood as KINGSWAY. 11.4.1906: Registered at Fleetwood (FD57), George W. Stennett appointed manager. 4.1906: Completed. Contract price £5675. 4.1.1909: Henry Melling appointed manager. 22.3.1909: Sold to Wilbur Johnston, Vancouver, BC, (managing owner). 6.1909: Fylde Steam Fishing Co Ltd in liquidation. 9.1909: Registered at Vancouver, BC. 1909: Sold to Joseph W. McFarland, Vancouver, BC (managing owner). 1912: Sold to Steamer Kingsway Ltd, Vancouver, BC. 1915: Sold to Standard Fisheries Ltd, Vancouver, BC. 1916: Sold to The Canadian Fishing Co Ltd, Vancouver, BC (Alvah H. Hager, manager). 1936: Sold to Vancouver Tug Boat Co Ltd, Vancouver, BC (Harold A. Jones & James A. Lindsay, joint managers). 1940: Sold to Vancouver Towing Co Ltd,Vancouver, BC. After conversion to motor, reclassed as a tug. Registered at Vancouver as La POINTE. 1940: Re-engined with 2 stroke 7-cyl oil engine by Fairbanks, Morse & Co, Beloit, Wis.
Re-classed as a tug 285g 108n. 1959: Sold to Vancouver Tug Boat Co Ltd, North Vancouver, BC. 1959: Re-engined with 2 stroke 6-cyl oil engine by Fairbanks, Morse & Co, Chicago, Il. (engine built 1954). 1968: Sold for breaking up. 08/04/2009: Page published. 5 updates since then. 19/10/2017: Removed FMHT watermark from image. This entry was posted in Steam Trawlers, Steamers (Picture) and tagged Fylde SFC on April 8, 2009 by Fred Smith. 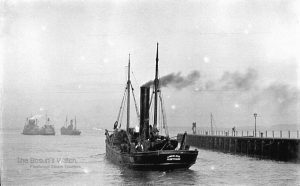 5.12.1896: Launched by Sir Raylton Dixon & Co Ltd, Middlesbrough (Yd.No.437) for The Mersey Trawlers Ltd, Liverpool as KINGFISHER. 1.1897: Registered at Liverpool (LL334) (1/97). Owen Ellis designated manager. 28.05.1899: Stopped by Scottish Fishery Board’s cruiser VIGILANT after attempting to escape when observed trawling off Aisa Craig in the Firth of Clyde prohibited limits. Escorted to Campbeltown. By 1903: Sold to Pratt, Ellis & Co, Liverpool. Owen Ellis & George J. Pratt designated managing owners. 2.1907: Sold to Fylde Steam Fishing Co Ltd, Fleetwood. 12.2.1907: Registered at Fleetwood (FD103). George W Stennett designated manager. 12.2.1907: Vessel mortgaged (64/64) to London City & Midland Bank Ltd, London (A). 4.1.1909: Harry Melling designated manager. 22.6.1909: Sold to Walter Olney, Grimsby. Walter Olney designated managing owner. 7.1909: Slipped at Fleetwood. Renamed DORTHEA – no port of registry. 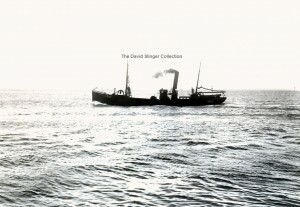 7.1909: Sold to Christian Evensen, Thorshaven, Faroe Islands (Evensen & Black). 7.1909: Registered at Thorshavn as DORTHEA. Continued fishing out of Fleetwood. Alick Black, Fleetwood designated manager. 1.1910: On a trip to West of Scotland grounds (Sk. Christopher Bird); ten Faroese crew. 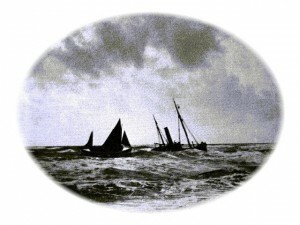 16.1.1910: Returning to Fleetwood in heavy weather stranded on the south end of Walney Island. Barrow lifeboat Thomas Fielden (Cox Herbert Raby) attended but with wind gusting 50mph rescue was difficult and crew had to be taken off one by one. On completion landed survivors at Barrow. 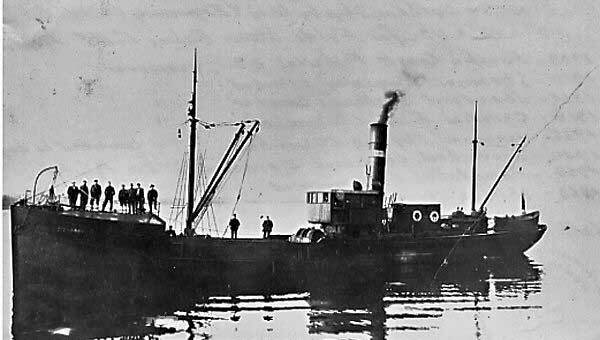 Refloated and towed to Fleetwood by Barrow tug WALNEY (204grt/1904). 1910: Sold to Walter M. Olney, Thornton. 2.6.1910: Registered at Fleetwood as LINCOLNIA (FD118) (BoT Minute 1096/1910). Alick Black, Fleetwood designated manager. 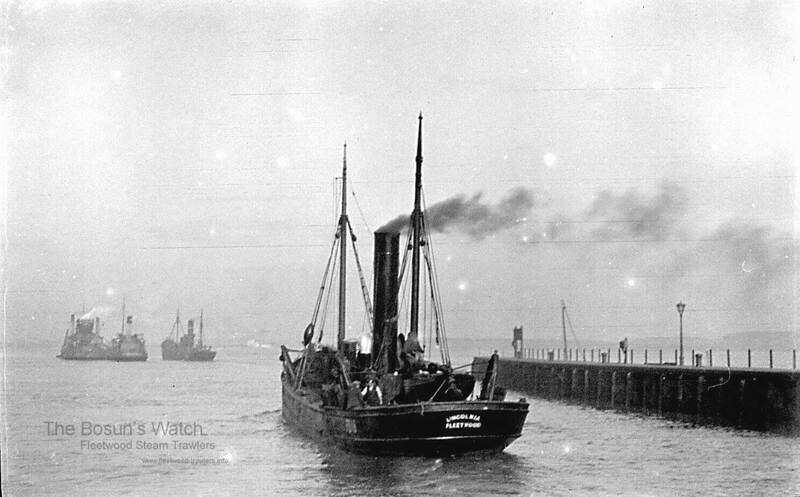 30.3.1911: In Wyre Dock had fire in forecastle after paraffin stove overturned. Extinguished by Dock fire brigade. 1.1.1914: Tonnage altered to 52.29net under provision of Merchant Shipping Act 1907. 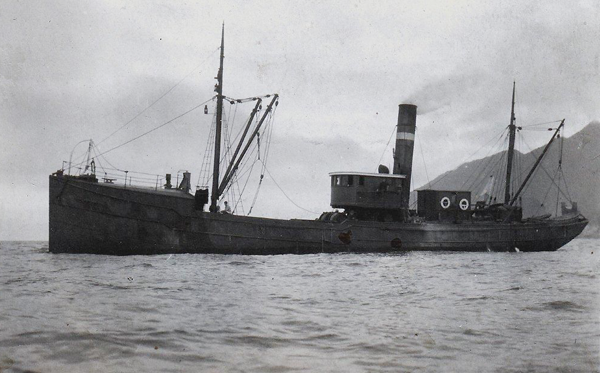 23.2.1914: In Lune Deeps, inwards for Fleetwood, in collision with steam trawler PHRONTIS (FD142) and badly damaged. 14.4.1914: Between Fleetwood and Holyhead suffered boiler problems, hoisted signals of distress and sighted by steam trawler LIZZIE (FD158) which closed and having been made aware of the problem, connected and commenced tow to Fleetwood. 29.5.1917: Requisitioned for Fisheries Reserve. 1919: Released (Sir Alec Black, Bart, Fleetwood, manager). 1925: Sold to Sydney Jacobs, London (Rowland Morris, Fleetwood, manager). 1926: Sold to Lincolnia Steam Fishing Co Ltd, Fleetwood. Rowland Morris designated manager. 1927: Sold to Reginald L. Hancock, Hakin. Reginald L. Hancock designated managing owner. 21.8.1927: Fishing Small’s ground 5 miles NNE of St. Ann’s Head (Sk. Thomas W. Jones), disabled with machinery defect. Steam drifter/trawler CYCLAMEN (LT1136) fishing nearby connected and towed to Milford arriving same day. 1928: Sold to Vincent T. Taylor, Chippenham (Reginald L. Hancock & H.E. Rees, Milford, managers). 8.11.1928: Registered at Milford (M214). 19.4.1929: Sailed Milford for grounds off the Smalls (Sk. William E. Johnson). 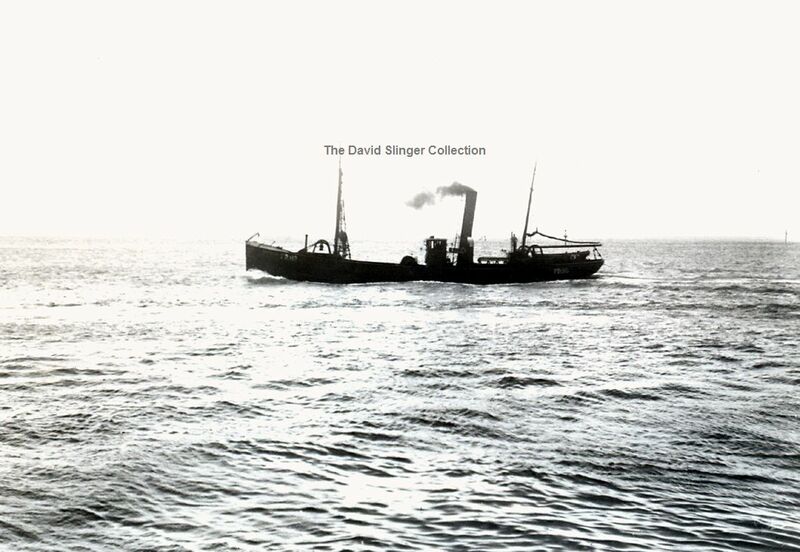 20.4.1929: Fishing 3 miles NW by W of Connibeg light ship, in Force 6, disabled with fractured tail shaft. Steam trawler CORVUS (M2) in vicinity connected and proceeded to tow to Milford. 21.4.1929: Arrived Milford. Corvus owners and crew claimed against owners and crew and settled for the sum of £308.3.0d plus £28 settlement fee. 3.1934: Sold for breaking up and broken up at Hancock’s Yard, Pembroke Dock. 11.10.1934: Milford registry closed, breaking up completed. 24/12/2008: Page published. 3 revisions since then. 27/11/2014: Picture added and information updated. 21/05/2017: Added image and removed FMHT watermarks. This entry was posted in Steam Trawlers and tagged Fylde SFC, Lincolnia SFC, Walter M Olney on December 24, 2008 by Fred Smith.